Harry The Librarian: "Just enter the $11.27 and see what happens!" "Just enter the $11.27 and see what happens!" There was no "share" button when I found this in The Boston Globe. Jody laughed out loud and showed it to me in the print version - we still have it delivered daily. I hope I'm not violating copyright laws by sharing this. 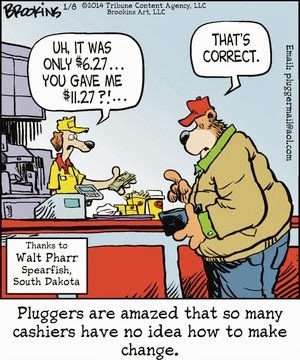 I am a Plugger in so many ways and this is an exchange that I've often experienced. Taking Ourselves Seriously - Or Not! Harry's "Barn Raising" = Public Goods. To emBEd or not to emBEd.